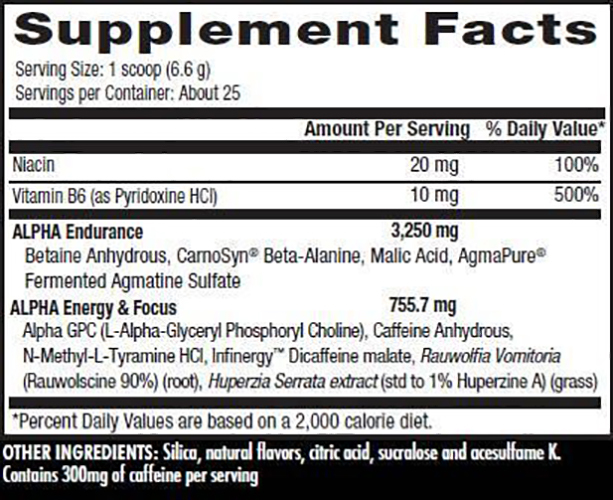 Concentrated Pre-Workout for Supporting Intense Focus and Energy During Exercise. Mix one (1) scoop with 10 oz of water 30 minutes before exercise. Do not consume within 4 hours of going to sleep. Begin with half (1/2) a scoop per serving to assess your tolerance. After 4 weeks of continuous use, discontinue use for 1 week before repeating. Silica, Natural Flavors, Citric Acid, Sucralose, and Acesulfame K.
Not intended for use by persons under the age of 18. Do not exceed recommended dose. Do not use if pregnant or nursing. Do not consume caffeine from other sources, including but not limited to: coffee, tea, soda and other dietary supplements or medications containing phenylephrine or caffeine. Consult with your physician prior to use if you are taking medication, including but not limited to: MAO inhibitors, antidepressants, ibuprofen, aspirin, non steroidal anti-inflammatory drugs or products containing phenylephrine, ephedrine, pseudoephedrine, or other stimulants. Consult your physician prior to use if you have any medical condition. Discontinue 4 weeks prior to surgery or if you experience rapid heartbeat, dizziness, severe headache or shortness of breath. DO NOT USE IF OUTER SEAL IS BROKEN. KEEP OUT OF REACH OF CHILDREN. STORE IN A COOL, DRY PLACE.